This computer simulation depicts a full rotation of Mars at opposition on 27 July 2018. The Red Planet makes its closest approach to Earth at 0745 UT on 31 July when the centres of both planets lie 0.385 astronomical units, or 57.6 million kilometres (35.8 million miles) apart – the Red Planet’s closest approach to us for 15 years. At this instant Mars displays a disc 24.3 arcseconds in diameter, shines at magnitude -2.77 and the planet’s south pole is tipped towards Earth. AN animation by Ade Ashford. Related article: Find Martian moons Phobos and Deimos at the Red Planet’s closest approach. You may wish to circle Friday, 27 July on your calendar. On that morning, planet Mars reaches opposition in the constellation of Capricornus, lies almost opposite the Sun and may be found highest in the southern sky around 1am local time for observers in Western Europe. Furthermore, on the evening of 27 July – in a rare bonus for observers in the UK – the planet rises in the southeast around 10pm BST, less than 6 degrees south of a totally eclipsed Moon. While you may logically assume that 27 July is also the date that Mars is nearest Earth, this is not the case. Owing to the eccentricity of the Red Planet’s orbit and that of our own, the least distance between Mars and Earth doesn’t occur until 8:45am BST on Tuesday, 31 July. Only the opposition of 2003 saw Mars get closer – 0.373 astronomical units, or 55.8 million kilometres (34.6 million miles) on 27 August of that year. In 2018, the distance between the centres of Earth and Mars will shrink to 0.385 astronomical units, or 35.8 million miles (57.6 million kilometres) on 31 July. The Red Planet will then reach a maximum angular size of 24.3 arcseconds when a telescope magnifying just 80x will enlarge it to the same size as the full Moon appears to the unaided eye. Note that Mars’ disc is 20 arcseconds or wider from 26 June to 6 September 2018. When Mars is close it is an imposing naked-eye sight in the night sky. It burns with a steady orange-red hue at almost magnitude -2.8 in the deep twilight hours of late July, far outshining any star. Sadly for UK-based observers, however, the Red Planet will be very low in the sky, peaking at just 11 degrees above the southern horizon as seen from the heart of the British Isles. Observers in the Southern Hemisphere fare much better. For example, as seen from the New Zealand capital, Mars attains a maximum altitude of 74 degrees in the northern sky at the end of July 2018. There is no denying that observing Mars from the British Isles in July-August 2018 will be a challenge, but there are ways that you can mitigate shimmering high-magnification planetary views. If you take the telescope outside from a warm room, always ensure that its optics have adequate time to cool down to equilibrium with the nighttime air (an hour is advised) before making critical observations. Try to avoid setting up on concrete or asphalt that retains the daytime heat; observing on grass is best. Also, try not to view Mars over the rooftops of houses where turbulent warm air currents are found. If at all possible, do try to observe Mars within half an hour or so of the time it transits (see our Almanac for local times) so that it is as high as possible above your southern horizon (or northern horizon if you live south of the equator). While there is not much we can do about poor seeing arising in the atmosphere, those nights that are slightly misty when a high-pressure system sits above us often show the steadiest planetary views. Even if the seeing is otherwise good the planet’s low altitude for UK-based observers means that Mars will display atmospheric dispersion, where the upper and lower limbs of the planet appear to have prismatic blue and red fringing due to our atmosphere acting like a weak lens. You can purchase an atmospheric dispersion filter to help counteract this, but a simple yellow/orange filter will help. Which side of Mars is facing Earth tonight? 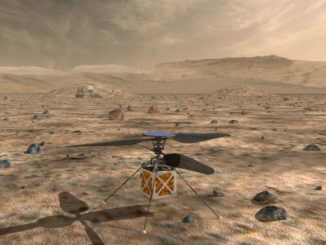 Mars can reveal a wealth of surface detail in quality telescopes of 6-inch (15-cm) aperture and larger when seeing conditions are good, though there is a strong possibility that the ongoing Martian dust storm will obscure areas of interest. A 3-inch (7.6-cm) ‘scope is sufficient to reveal larger features such as the Syrtis Major, Hellas or the Mare Sirenum. For this opposition, Mars’ southern pole is tipped about 11 degrees towards Earth in a position angle of about 186 degrees. Note that the South Polar Cap (SPC) varies in size, being most extensive around the Martian southern spring equinox on 23 May 2018. The approximate size of the SPC at opposition is shown on our Mars Mapper app. The Red Planet also shows an appreciable phase several weeks before or after opposition. To help you identify the main surface features visible from now through to the end of October 2018, make use of our interactive Mars Mapper web app below, or visit its homepage. 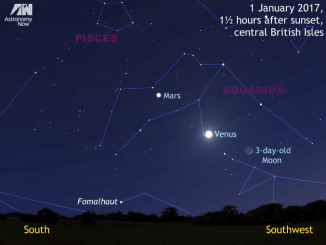 The young crescent Moon’s nightly motion from 31 December 2016 to 3 January 2017 carries it past dazzling planet Venus and first-magnitude Mars. A small telescope also reveals outermost planet Neptune, which passes just 0.02 degrees from Mars around 7h UT on 1 January, offering observers around the world a New Year’s Day treat. 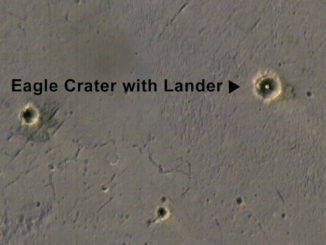 NASA has released the first high-resolution aerial colour image of the Opportunity rover’s landing site on a sprawling Martian plain, where the airbag-cushioned robot fortuitously rolled into a Eagle Crater in January 2004, putting its scientific instruments face-to-face with a block of sedimentary rock that gave ground teams confirmation Mars was once a warmer, wetter, and habitable planet.